The GoSea Standard Back rest for Sit-On Kayaks is both Lightweight and Durable. Made from a hard wearing Thermoformed foam and fabric combination. 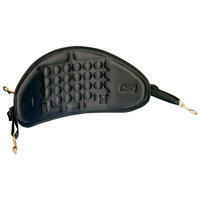 The GoSea Sit On Kayak Standard Back Rest provides good support for the lower back. Four adjustable webbing straps and brass dog clips allow for easy fitting to deck mounted eyelets on the kayak. Once fitted in place, the back rest can be adjusted accordingly to the requirements of the user.